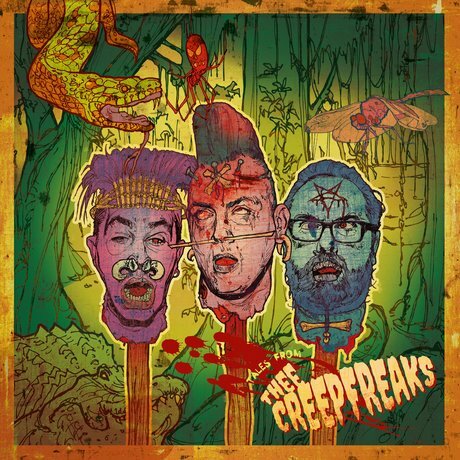 Thee Creepfreaks are a psychobilly trio from London, combining up-tempo drumbeats, loud dirty guitar and demonic vocals. In the summer of 2012 Peter (ex-Nocturnal Teds/ Miniskirt Blues) dusted off his rockin’ guitar and called double bass player Anthony and they started starting rehearsing and stringing together a few tracks and after a few different drummers they found the bone rattling beats of Jeremy (Devil Crockett). After Anthony left the country we have hooked up with our new bass player Ash and are roaring and ready to go again…. And after Jeremy left the country we have hooked up with our new drummer JR and are roaring and ready to go again…. and again…. Since their first gig at The Klub in Camden, they’ve been playing regularly in London supporting bands like Mad Sin, Tall Boys, Demented are Go and many others. With a love of horror, armed with macabre lyrics and a view of the world in demise, these psycho love children of Lemmy and Elvis will get the pit going and have you howling at the moon until the early morning light. Our debut 12″ album is available from our online shop!